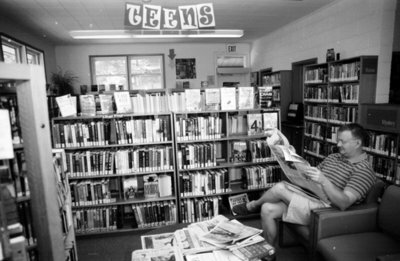 A black and white photograph of a gentleman reading by the Teen section at the Brooklin Library. The Brooklin Library was built in 1960/61 and demolished in 2010 when a new library was opened on the same site. The building was officially opened on February 8, 1961 by the Honourable John P. Robarts, Ontario's Minister of Education. A large portion of the funding for this building came from a bequest from the late Edna Burton, who died in 1957. 8 Vipond Road, June 2006, Carl Ferencz. Whitby Archives A2013_019_002A.